What Drives Your Hustle for Worthiness? If we spend a lifetime trying to distance ourselves from the parts of our lives that don’t fit with who we think we’re supposed to be, we stand outside of our story and have to hustle for our worthiness by constantly performing, perfecting, pleasing, and proving. are trying to make sure everyone approves of you. “Everyone” has differing views, opinions, and needs, so it is exhausting to try and keep “everyone” happy. And since it is impossible to please “everyone”, the hustle is perpetuated. are hiding parts of your story for fear of rejection and judgement. Your story is YOUR beautiful mess and glory-of-a-story. When you deny speaking and living your story and delegate your worth to “everyone” else, you end up missing out on true connection, healing, and joy. are avoiding dealing with deep soul pain (or even surface wounds) for fear it will leave you alone or cause you more pain. Hustling for worthiness is an excellent numbing agent to fear, shame, pain, and keeps you from reaching out and asking for help. But this hustle is not sustainable and can become a gateway to some serious issues emotionally, physically, relationally, and in your faith journey. believing the lies that you are not worthy of love and belonging. This is the ultimate lie of shame. And when this belief is driving the motivation behind your thoughts and actions, then you are living life on the sidelines but deeply longing for a sense of worth and belonging – for which you are hardwired. Our upcoming Hustle for Worthiness Encore Workshop on September 13 will help you develop a better understanding of what drives your own personal hustle. Register to soon to reserve your spot – it usually sells out quickly! At this workshop, we gather together to view an exclusive video of Brené Brown sharing her powerful research on perfectionism, shame, and vulnerability. Participants enjoy a lovely spread of food, a stocked art bar for creative inspiration, and a journal to use to take notes and document reflections. Hustle for Worthiness is different from our other workshops in that it intentionally does not have a lot of structure. This is our introductory workshop offered in a safe and casual community. The video we show is not available for purchase, so this is one of the few venues in which you can view it. A lot of people attend this workshop because of their connection to me, one of the members of the Potentia team and/or their connection with Brené’s powerful message. Friends, family, significant others are welcome. You do not have to be a client of Potentia to attend. Part of the power of this work is that it brings us together. Connection and community help you put into practice your shame resilience skills. If you have mustered up the courage to come alone, please say hello. I think you’re freakin’ amazing! Just the act of showing up to a group where you will be seen is vulnerable and brave and proves you are tired of living your life on the sidelines. Is this workshop only offered in San Diego? For those of you in SoCal, I would love to see you at our next Hustle for Worthiness Workshop. It usually sells out, so make sure to register soon if you would like to join us. If you do not live in the area, I am happy to connect you to someone in The Daring Way community who could facilitate a workshop for your community. Just send me an email at rbass@potentiatherapy.com. Every time our Potentia team hosts this workshop, I find it truly magical to see people take in Brene’s words and feverishly write down the powerful nuggets that spoke to them. Expect to exhale deeply, laugh out loud, and elbow your friend knowingly. It happens every time! Note: HFW alumni who want to bring a friend, your registration fee is on me. Just email me at rbass@potentiatherapy.com as I only have a limited number of slots available for alumni. Desire to dig deeper? There are several other mini workshops coming up this fall that offer a more structured flow and will provide action and insight as you seek to refine your shame resilience skills. And SoCal locals and out-of-towners alike, please consider joining us at one of our (re) define Courage: Dare to Show Up + Be Seen Weekend Intensives. The September workshop is sold out, but we still have space for our November 1-3 event. Our schedule for the 2014 Workshops and Weekend Intensives will be posted soon. Sign up for our (re) Define Courage email list to be the first to know about these dates. PS – And do not forget to register soon if you want to attend. This workshop is expected to sell out. And for every workshop you register for in the month of August, you receive an entry to win a $100 Anthropologie gift card. How are you dealing with your fears and doubts? Last week, two women I think the world of personally and professionally, Tara Gentile and Brigitte Lyons, wrote to their list of business owners and thought leaders about how fear, anxiety, and the “not enough” storyline can hold us back from living out our purpose; our calling. I am grateful for their words on a topic so dear to my heart. I have learned first hand your personal belief about yourself can nourish or kill creativity and the clarity on your calling. So I am writing this post to all of you who are not writing, creating, launching, leading, speaking, not showing up because fear, anxiety and negative core beliefs are keeping you from living your purpose. I am writing to all of you who are afraid of being found. Sometimes it is hard to discern between rationale fear and irrational fear. Rational fear keeps us safe from death or harm. Irrational fear tells us we will die or be greatly harmed but it is not based in fact – even though every brain cell firing tells us to stop, freeze, numb out and hide. Sure, you can push back on irrational fear and its first cousins: anxiety, worry, stress which feed the “not enough” thoughts. But changing the narrative of “not enough” is not always a simple switch to flip. And leaning on sheer willpower is not a sustaining source of change. When the willpower fuel tank runs out, shame and fear are the fumes that run our lives if we are not careful. Trust me. I have lived seasons of my life on sheer willpower and these toxic fumes only to get burned out and crash hard. Three years ago, I began to make plans to move Potentia from just a website to having a collaborative practice of specialized, highly trained professionals all under one roof in a space that felt safe, homey and inspired healing and creativity. I had also recently given birth to our second child and had a lot of big dreams burdening my heart but struggled with finding the space and the systems to execute them. I was full of joy but at the same time I also hit a wall with my own expectations of myself. Then the green monsters of jealousy, envy and perfectionism took hold and it got pretty ugly in my brain and soul. Given my season of life, I was tired and did not have the usual freedom to connect with my support system. Where there is isolation, shame and doubt have a party. I was my own worst enemy as God continued to prod at my my heart for me to trust Him and His leading of me and this dream He had given me. God trusted me with this dream. I just did not trust myself. I have found that the “never enough” belief is able to be diminished but if you are driven, desire excellence and have big dreams, then it never really goes away. This is a vulnerable and tenuous space to hold in your heart and mind. I saw this tension in my previous careers in politics, advertising, international youth work and see this tension now in my work with my clients – many of which are filled with an entrepreneurial spirit as business owners, corporate executives, ministry leaders, creatives, educators, therapists. Developing a practice of community, connection and self-care is a non-negotiable for any creative, dreamer, leader, parent, business owner ie: human. And this is a life long practice. This practice is one of shame resilience. A practice cultivating courage so we can all dare to show up, speak truth, ask for help, take a break, write the check, say yes, say no, press publish, send the email. Managing fear and doubt is still not easy but these emotions sure as heck do not blind-side me like they used to. Studying disordered eating, trauma/distressing life events and shame resilience have had a profound impact on my own life. And I love supporting my clients and those in the Potentia community in their goals to (re) define health in their own life personally and professionally. Healing distressing life events, food and body issues, traumas and family of origin wounds are not indulgent but often necessary in order to have courage to bench leading, loving, dreaming, launching. Your fears, worries and negative beliefs are not the enemy. How you respond to them is what jams you up. Learning how to bench negative and intense emotions is key so these emotions can help inform you instead of paralyze you. Potentia is offering three options to attend a Cultivating Courage Weekend Intensives this year so you can improve your ability to manage negative and intense emotions, identify and re-author the narratives of negative core negative beliefs and begin a practice of shame resilience. We would be honored to help you get unstuck so you can live your life to the fullest. The world needs you to follow your calling, show up, lead, create and be seen. What specific fear or belief is holding you back and keeping you stuck? 2013 has been full of some serious body image blues. A couple things crept in that started to take away from my New Year’s calm and clarity (my word for 2013): lack of sleep because of all things toddler (winter colds, potty training..) and my newly diagnosed asthma. I was missing my time with my boot camp buddies – my one-two punch for social and active time. I hit a wall. Right about the time I was doubling the staff at Potentia. We just completed two successful cohorts of our 8 week Cultivating Courage workshop and put dates on the calendar for three Cultivating Courage Weekend Intensives. I was super pumped about all these happenings but was getting really depleted and disconnected from my social support. My health was starting to suffer, too. And in walked my body image blues right through the front door. But here is where things took a different turn. My discomfort in my skin did not necessarily dissipate but how I responded to these thoughts and feelings took a rather radical detour. I practiced, practiced and continue to practice my shame resilience skills. I dug in and wrote my daily gratitudes and read my daily devotions. I got really clear on my needs and spoke them to my friends and family, not as demands but as requests. I made my self-care – mind, body and soul – a priority and made sure my schedule reflected these values. I practiced empathy with myself and others when judgements and crankiness reared their ugly heads. I re-evaluated my boundaries and made sure I was not setting up walls which protect but also isolate. I spoke my truth to my really, really safe people. I now know I am enough even on days I do not feel enough. I can hold that space while I feel yucky and not attack my core worth. Some days it is a bit of a knock down, drag out fight – but shame resilience has helped me run the marathon of living life reflective of my values and my true worth. Those who work in the eating disorder field are not immune to struggling with their own food and body issues. It was pretty incredible to see how the ongoing practice of shame resilience kept me from dancing in the pit of self-loathing for very long. It has helped me practice respecting my body even when I do not like it much. Yeah, I am not immune to these thoughts or feelings. But how I respond when they hit has truly been, well, awesome. Negative body image is often the equivalent of that scratchy throat you get when feel you are starting to get sick. If you ignore the symptoms and do not take extra care to build up your immune system, you will get leveled and feel even worse, taking longer to recover. And instead of going old-school and obsessing over weight, looks and what others think, my shame resilience skills are (almost) my default now and the obsessive tendencies to measure my worth by the number on the scale (if I had one) or how much I have worked out were not nearly as loud as they used to be. This new response to shame has been so, so, so freeing and healing. Instead of fearing vulnerability, I have grown to understand and respect its place in my life – though I do not like the feeling of it most of the time. Reading Brené Brown’s books over the last few years have been so helpful in building my awareness about shame and normalizing the universal experience of shame. I developed a whole new vocabulary. But these last 9 months training with Brené, Robert Hilliker and the rest of the Connections team to complete my Certified Connections Facilitator Certification moved me from an intellectual insight of this work to a daily (well, mostly daily) practice. I have seen the fruits of this practice in my marriage, my work as therapist and in my relationships with God, myself and others. And this is why I can barely contain how excited I am to offer this work – Potentiafied for you in our Cultivating Courage Workshops and Weekend Intensives. We have three Cultivating Courage Weekend Intensives scheduled for the remainder of this year: June 14-16, Aug 23-25 and Nov 1-3. And my colleague, Molly LaCroix, and I will be launching our 8 week Weekly Cultivating Courage Workshop Series in January 2014. For those who are local, we have some digging deeper workshops which will be launching this summer to give people a chance to freshen their Shame Resilience skills or have a toe-in-the water experience with this powerful work. And plans are in the works to take this work online so our Potentia friends outside San Diego can have access to this material, too. Make sure you are signed up to receive email updates so you can get the latest details on all of these happenings. I would love to know what your questions are about shame and Brené Brown’s shame resilience theory. Please email me directly at rbass@potentiatherapy.com or post your questions below. If I feature your question in a future blog post, you will receive a copy of Brené’s most recent book, Daring Greatly. So don’t hold back, I really want to hear from you. Working on being my own cheerleader while cheering you on, too! In my tribe of Eating Disorder Treatment Specialists, we often say negative body image is the first to come and the last to leave in the treatment of food and body issues. And that is a pretty constant truth from the many recovery journeys I have witnessed over the years. My clients have taught me some more nuanced facts about body image, regardless of whether they have had a full blown eating disorder or not. Everyone has (at least) a bad body image day. Depending on where you fall, if at all, on the disordered eating spectrum, dealing with dark, obsessive, and/or negative thoughts and compulsions regarding your body is a part of the gig when dealing with disordered eating. My ____ is so ____. My _____ looks so ____. When I _____ I will be _____. My _____ will always/never be_____. So many try to manage these thoughts and feelings by stuffing them and putting on their “I love my body” and “It’s all good” masks of virtue, hiding the truth that they are living at war with their body. Others externalize these thoughts and add to the cacophony of negative body talk and diet talk. And this is where things often spiral. And this can lead to a dark journey into the world of eating disorders and disordered eating. Yet, many hover in this place of emotional ickiness where they cannot shake the uneasiness of living in their skin and make genuine, though harmful, attempts to get relief. For many of you, this battle really is not about your body. If my client is stable emotionally and physically, and her needs are met nutritionally, then I often look at negative body image as a sign of something bigger. Like when you get that scratchy throat feeling. It is a sign you are on the verge of getting really sick; it is not just about the sore throat. You know you need to rest, to take some extra Vitamin C, drink some tea, ask for help with projects, cut back on your social calendar. When the yuck of a bad body image moment comes up, it is often a sign of something else going on in your life. I move my clients away from the laser focus obsessions on what needs to change with their body and pull back the blinders to look at what else is going on in their life. The key is not to focus on the goal of eradicating negative body image days (though the parallel process is to decrease the frequency and intensity of those days, for sure) but instead to respond on those days, weeks, months when you are feeling crappy in your skin DIFFERENTLY. Instead of defaulting to negative food and body obsessions and action, I work with my clients on how to acknowledge what they are really feeling and what they are really thinking in that moment. Then we focus on respecting those thoughts and feelings in the moment. I also emphasize the truth in how my clients feel. What they feel is always real but rarely is it ever fact. Finally, we focus on how to respond differently when body hatred arises. Instead of stuffing, minimizing or denying — which only fuel the negative thoughts and coping tools — I work with my clients on accessing new tools and strategies when the dreaded body yuck surfaces. When there is too much focus on feeling better in your body and not looking at the correlation with bad body image to other factors — physical, emotional, social, and spiritual — then I think we are limiting the potential of experiencing true health and true healing. And it is ok not to love your body all the time. But I think it is imperative to focus on respecting your body and being grateful for your body — even when you do not like it. You can actually dislike your body while also showing your body respect and gratitude. Eventually, respect and gratitude will win if you hang in there. For example, there are a good handful of people I know that I do not care for but I respect them, treat them with dignity and kindness, and find space for being genuinely grateful for the challenging relationship. Consider this strategy in your relationship with your body. With heavy doses of respect and gratitude in addition to responding differently to your bad body image days, the feeling of your body never being enough may dissipate, and an eventual truce with your body may be declared. And if one of those days surfaces again, the hope is you do not shame yourself for backsliding in your recovery but see your body image woes as a clue, a hint to investigate what is out of sorts in your life. All the while administering generous doses of respect and gratitude. How do you deal with your bad body image days? Do you agree that it is not realistic to achieve a space where you never have a bad body image day? When it comes to shame, we are all in it together — it levels the playing field. There is no “us and them” with shame. Like thousands upon thousands, I deeply resonate with Brené Brown’s research, books and Ted Talks. I have been integrating her definitions and theoretical orientation into my work with clients, in my own life and faith walk over the last few years. And I longed to do this work on a deeper level. So when the opportunity to train with Brené and her team came up – I was in. And I found out how much I was in last weekend during the second of two weekend trainings. There is no getting around it: You must do your own shame work in order to facilitate this material Wholeheartedly. In my research I have found shame to be a difficult and painful topic for both laypeople and mental health professionals. Unlike many of the other topics that professionals study, when it comes to shame, there is no “us and them”. As professionals, we don’t have the luxury of thinking, “Let me learn about this topic that affects my clients so I can help them.” Shame is universal – no one is exempt. If we can’t talk about shame and examine the impact it has on our own lives, we certainly can’t be helpful to others. Our most basic ethic as mental health professionals is “to do no harm”. I believe we risk violating that ethic when we examine issues with clients we have not examined in our own lives. Since I started this training last July, I realized it is one thing to read the books, listen to the Ted talks and seminars, and recite the definitions in talks and in my sessions with clients. And it is a whole other thing to live. this. work. I had originally planned to have my husband come with me on this weekend away. I knew this work was going to be hard. Getting personal with a bunch of professional people I did not know sounded like a mild form of torture. But my husband had to cancel at the last minute. So I went into this experience way more vulnerable then I intended. I was still under the impression I could avoid vulnerability while still meeting my desire for connection. And I began to build up my armor. I made commitments to myself to only share “this” much. I was going to just have a toe-in-the-water experience, check the box and then get on a plane to go home. Stat! After I arrived at the training site, I had some precious quiet time. I felt this quiet nudge that said, “Go deep. I am here with you. Allow yourself to really be seen.” I pushed back. Yeah, it was a scrappy prayer time. But I trusted where I was being led and the leadership team. I pushed through the resistance and leaned into the experience. I shared. And was seen. I cried at times — in public. I did not share the deep soul dark stuff in full detail but I pushed myself to touch on it. I was vulnerable in all its glory. At one point, I dropped into the shame zone. I began to hand over my worth to others. I worried what the other participants and leaders thought. Surely, I was going to be the first person they denied certification. I was too much. A burden. Not fit to be a clinician. I blamed, judged, and thought things that were pretty ridiculous in hind site but at the time seemed completely reasonable. I had tunnel vision. And then I remembered to pull my worth off the table and not leave it open for discussion or debate. I practiced the skills of shame resilience. I drew from courage and spoke with a new friend. I named my shame. I connected. And I felt clear again. Still raw, but grounded in Truth because I reclaimed my worth and value from the collective other. I felt empowered because I was able to reboot and get grounded so quickly. Yes, I still struggle with the discomfort of vulnerability, but I have a new-found respect for it after this experience. I am exhaling into the growth, catharsis, and healing that comes on this side of experiencing vulnerability along with a deeper sense of connection and intimacy with those in my life. And I know this process will continue for the rest of my life. But I now am better equipped when I see shame a-comin’. Empathy, Authenticity, Vulnerability, Courage, Shame — they are no longer trendy jargon to me. They have three dimensional meaning and depth that has come from doing this work. Living this work. And my commitment to scaling this work is more impassioned then ever. This week, we are wrapping up two cohorts of our Cultivating Courage Workshop at Potentia. I am still in awe of what I witnessed from the 20 people who went through this experience. We will be launching mini workshops on topics that support this work in addition to weekend Cultivating Courage Intensives and more weekly workshops. Even if you do not live in San Diego, there is an opportunity for you to dig deep and start the journey towards building shame resilience. I would love to walk with you on this journey. It is hard and important work. But never forget, we are all in it together. I have been thinking a lot lately about the people I have had the honor to meet and work with over the last (almost) 10 years. I wish I could share with you the intricate details of their stories of heartbreak, despair, pain, victory, and perseverance. They have taught me so much about the disordered eating spectrum, grace, humility, and redemption. What I can do is share with you how many of the people you interact with every single day are hurting inside and masking it so well that you have no idea what is really going on in their minds, hearts, and souls. for hurting and hating their bodies, their lives, their existence. You see their smile, their amazing work ethic, the kind disposition. You laugh at their jokes and praise them for their faithful service and always being available to help. Or you may be distracted by their extra weight, their health struggles, their mood swings and think it is just about the food, just a phase, or simply manipulative attention-seeking. Think again. It is probably so much more. We live in a culture that is not showing any signs of letting up with the pressure to fit into a certain size, shape, look, way of being. While there are more and more people desiring authenticity and courage — and stepping up and living it — there are still so many people you know who are terrified of being seen in their pain, their darkness, their cesspool of destructive choices. I hear many cheer on stories and acts of vulnerability. I deeply admire those sharing their stories while living a life of courage. It is medicine for the collective soul. But when I step out of the safe zone of my home, my inner circle of support and Potentia, I am up to my eyeballs in snark, criticism, bitterness, cruelty, bullying, and fear. Yes, there is hope and light amidst the toxic culture we live in, but wow. It is intense out there and many are breaking under the pressure. You may not notice these individuals screaming loudly from inside their minds, but look again. You may be too busy, overwhelmed, or caught up in your our pain to see that others are struggling, too, right in front of you. Understandable. It is hard to be human. Or you may think really seeing, sitting with, and empathizing with someone’s pain is too hard, unbearable. Indeed. That kind of connection is a full body commitment and investment. Healthy boundaries (not walls) are needed so you can discern what your limits are on any given day. But I think we can no longer tolerate looking away from the pain of those around us. This is volatile ground to tread. But when you hear someone speaking poorly about their body, dieting (the gateway drug for eating disorders), negligent with how they nourish and care for themselves, please do not tell them how to change or look away. Please do slow down and listen. Build a relationship with the person you are concerned about. Ask questions. Seek to understand. Listen some more. That in itself is so life-giving to someone living in emotional isolation. I hear many people say, “I do not get eating disorders. That is not my struggle.” You may not struggle with food and body issues, but I suspect you know full well what it is like to feel alone, rejected, ashamed, overwhelmed, afraid, and helpless. So yes, you can connect with someone struggling with an eating disorder regardless of whether that is a part of your story. At the heart of a lot of the wellness issues in our country is deep emotional pain. Genetics, family of origin, trauma, temperament, and distressing life events all play intricate roles in this complex and damaging illness, and the reductive solutions offered by many are fueling the pain, not relief. 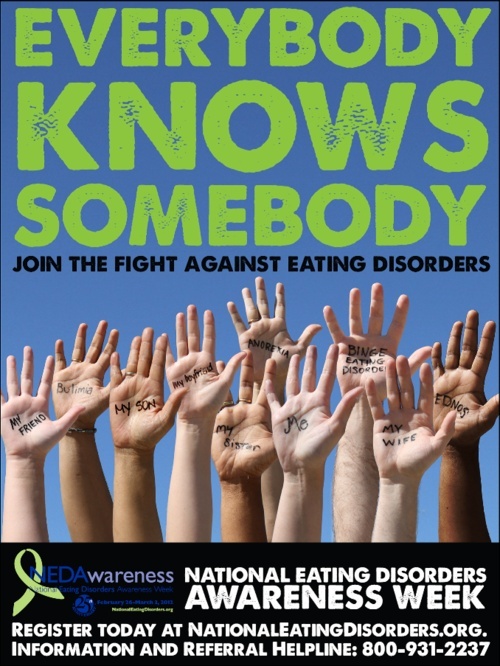 If you want to learn more about the disordered eating spectrum, check out the National Eating Disorder Association website. It is an incredible resource for those who are struggling with and those who are learning about eating disorders. How have you reached out to someone struggling? What was difficult? What went well? Please do share! Another Valentine’s Day is here. At my house, there is an explosion of hearts: garland, paper, stickers, lights, plates, cookie molds, place mats, table cloths and more. It has been fun to celebrate love with the three people I adore the most on this planet and who are responsible for healing my heart+increasing its capacity to give and receive love. But this day was not always a fun one for me. When I was in elementary school, I would measure my loveableness by comparing the number of valentine’s I received in my uniquely decorated tissue box and then comparing that amount with the booty my other classmates received. In high school, I did not have a boyfriend (though I always had a crush or two) but would be privy to the elaborate date night plans my friends and their sweet hearts would make for this oh, so coveted of nights. It was fun to hear about all the fun ideas and caring gestures my friends would put together. Yet, behind my smiles and words of support, was a heart wanting to be seen + loved. It was not Valentine’s Day for me. It was Vulnerability Day in neon lights. Now, I am especially grateful for the people in my life day in and day out who show me continually what it means to be loved and feel loveable – even when I am far from that. I am thankful for a God who loves me in the fiercest of ways though that fact is so hard for my mind to comprehend in the noisiness of this world. Yet, I am still keenly aware of how hard this day is for many. It is salt on the wounds of loneliness, desire and longing. This day can poke at the cumulative distressing life events stored in your heart+mind depleting your motivation to do what you need to care well for yourself. While I have seen EMDR help many experience healing from distressing events in their lives, I know safe and loving relationships are crucial for sustained healing. So when I read Anne Lamott‘s Facebook post on Sunday, I was inspired. I also laughed out loud – because she has that way with her words – getting you to laugh about the most deeply painful experiences because she taps into what is shared by so many. I would estimate that approximately 17% of people enjoy Valentine’s day. Mostly, women will be given boxes of chocolates that they don’t want and can’t resist, and will be really mad at themselves for inhaling. Many people will be filled with resentment, anxiety, and guilt at having forgotten, or having shown up late, or having accidentally been having affairs with other people. Many people will feel a sheet-metal sense of loneliness and rejection. They will be comparing their insides with other people’s outsides, especially those happy valentines actors in advertisements and commercials. Most of the day, except for the lucky few, will be a nightmare. So let’s start an Occupy Valentine’s Day movement. Let’s begin with the premise that another word for Valentine’s Day is Thursday. And on Thursday, as an act of radical self-care, we will celebrate the miracle that a few people love us SO much, that we can go on, and bear up, no matter what; that even though they know the darkest, most human and intimate and disgusting stuff about us, they still love us. In fact, they love us more and more through the years. This is so wild, and is really my only hope. It is what salvation looks like. A handful of friends is the reason my faith in God is so deep. Because they ARE love; they (along with the dogs) are my most obvious connection to divine love in this joint, the looks of love on their faces. I think Anne is definitely on to something. So let’s follow Anne’s lead and get all subversive on the current rituals and commercial imagery of Valentine’s Day. It is in need of a make over and I think we are up for the challenge. Hug. Write a note. Make that phone call. Send a text. Reach out. Listen. Take the bubble bath. Wrap up in your cozy blanket. Listen to the music that evokes the emotions you are trying to numb out. Get outside and breathe in some fresh air. Let some sunshine radiate in on the darkness you are fighting. I do not need a day to celebrate those in my life who love me regardless. But I agree with Anne Lamott: it is indeed a miracle to have their love. And that is what I am going to celebrate with extra care and intention tomorrow. Who is the person you want to celebrate in honor of the love they have given you? How are you going to show love and respect for yourself+others outside of the traditional hype tomorrow? Do share! I want to celebrate with you.